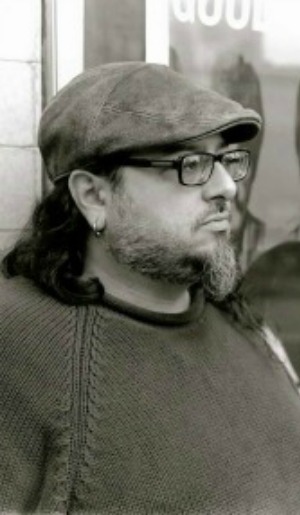 Clark County Poet Laureate Christopher Luna is a poet, publisher, visual artist, teacher, and editor. He has an MFA in Writing and Poetics from the Jack Kerouac School of Disembodied Poetics at Naropa University in Boulder, Colorado. Christopher is the editor of “The Work,” a monthly email newsletter featuring poetry events in Portland, Vancouver, and the Pacific Northwest. He is also the co-founder, with Toni Partington, of Printed Matter Vancouver, an editing service and small press that serves Northwest writers. Christopher’s spoken word recordings have been featured on Dr. Demento, Vin Scelsa’s Idiot’s Delight, and KBOO FM’s Radio Lost and Found hosted by Rich Lindsay. His poetry has appeared in Bombay Gin; Twenty Four Hours Zine; Chiron Review; and many, many more. He has also had articles and criticism in the Columbian, the Oregonian, Willamette Week, and numerous other publications. Christopher’s books include tributes and ruminations (Dristil Press, 2000); On the Beam (with David Madgalene, 2005); Sketches for a Paranoid Picture Book on Memory (King of Mice Press, 2005); and GHOST TOWN, USA (This is Not an Albatross, 2008). His most recent publication is Brutal Glints of Moonlight, a chapbook of poems based on Norman Mailer’s 1980 Pulitzer Prize-winning novel The Executioner’s Song for Pulitzer Remix, a National Poetry Month project sponsored by the Found Poetry Review. In addition to teaching at MAC, Christopher teaches a monthly poetry workshop at Niche Wine and Art Bar and has organized a series of bilingual poetry readings at the bar.